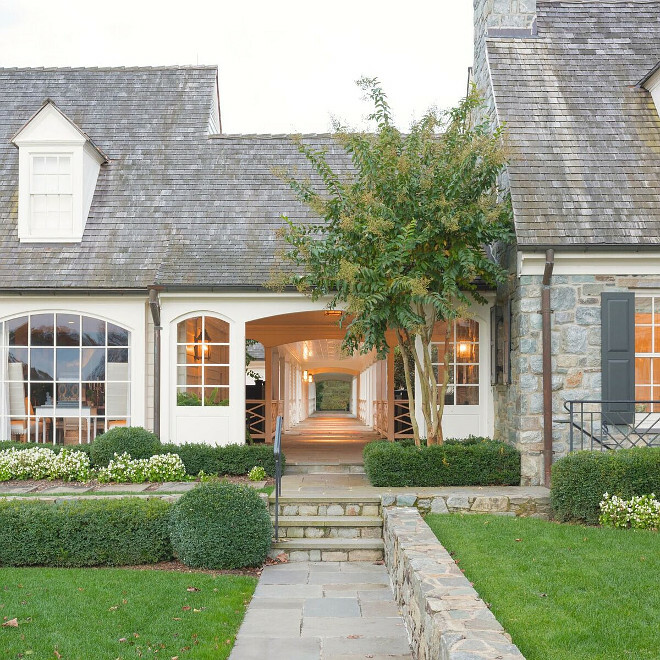 Beautiful Homes of Instagram became one of my favorite series on Home Bunch for many reasons. 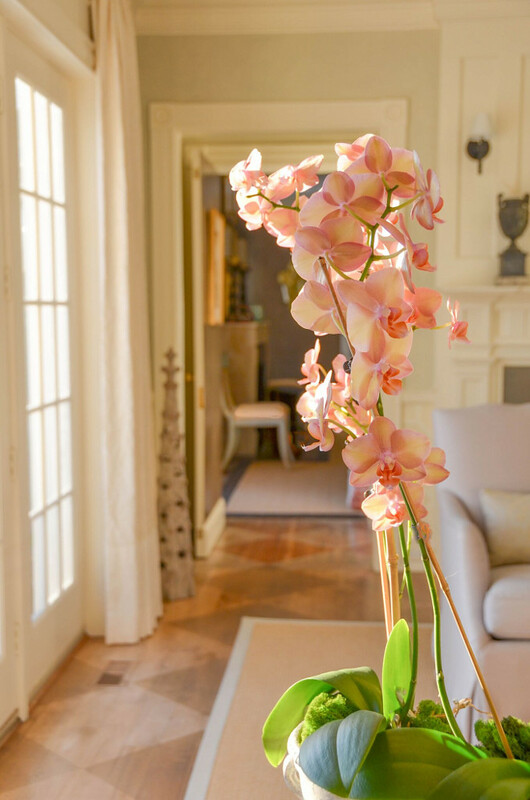 We get to know all of these talented homeowners, we see how they decorate their homes and not to mention that we get to see a different a home with its own unique style every week. This is a series that never gets boring! How can I describe Missy’s style from @missyatperch without mentioning her personality? I’ve being following Missy on Instagram for a while now and it was wonderful to get to know that she loves to decorate and adds something new to her home often. She is talented and sweet and you can’t help but adore her. Missy lives in a house that is truly a dream… one of those places you drive by and you wonder who lives inside. 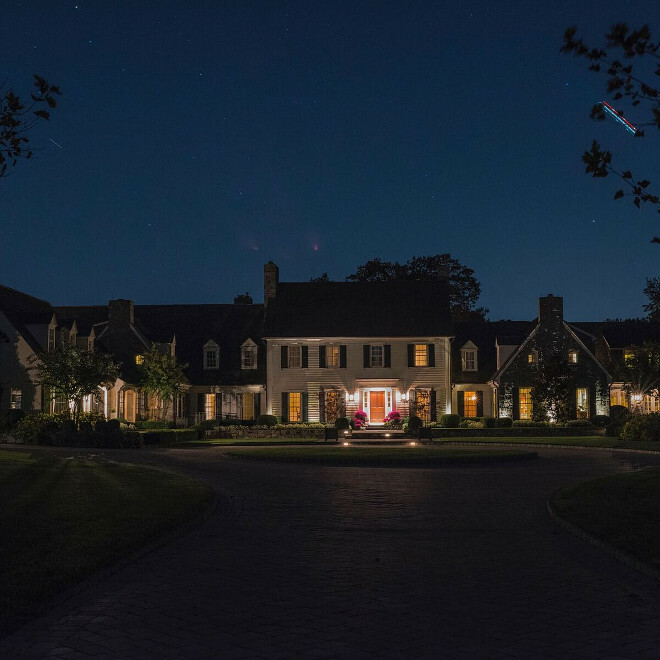 Today, we will not only know who lives in it but also have a private tour with pictures taken by the homeowner and with all of the details shared. Here, you will also see how much this home is loved. 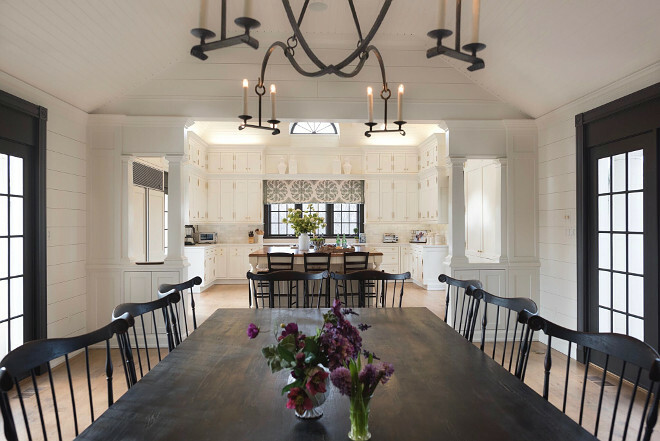 The love can be felt in the details and in the beauty this home exudes, inside and out. the kindest and most supportive group of incredible people. I love the friends that I’ve made here over the last year! My husband and I met on a blind date and we will be celebrating our 25th anniversary this year. We share our home with our three sons; two in college and one in high school. We also have two very spoiled retrievers, Brady and Griffin – you might see them in some of the photos! Joe and I met in NY and lived there for 9 years before moving to the DC suburb of Potomac, Maryland to be closer to family. We bought our forever house, spent 5 years renovating and furnishing it and planned to live there until our boys were grown. As luck would have it, an opportunity to buy an adjacent property presented itself just as we were getting comfortable in that forever home and in 2005, we started all over! We spent two years renovating our current home and we’ve now been here for ten years. 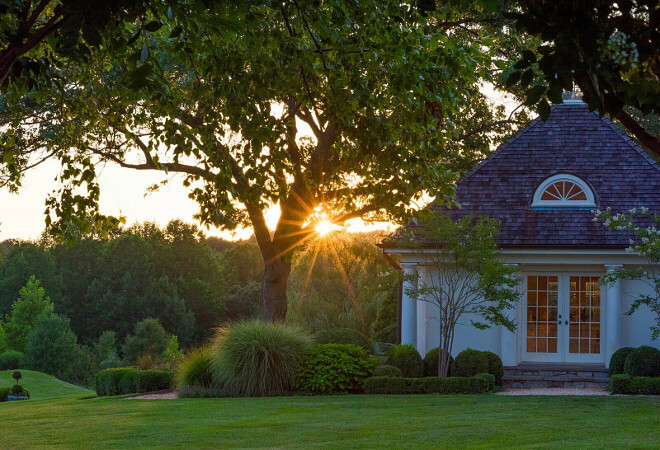 We love the house, but it was the land that sold us on this property. We have about 40 acres and my family, especially our dogs, really takes advantage of our land. 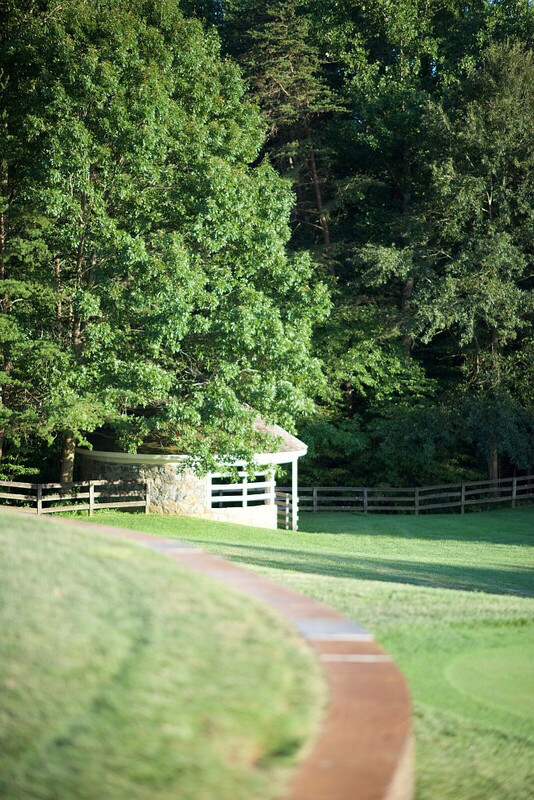 We can hike, swim, ride bikes and play golf, tennis, basketball and volleyball without ever leaving home. I love having a garden and I can keep cut flowers in the house from spring through fall from our yard. Having a few extra acres also allows us to have a handful of outbuildings, which is super handy. 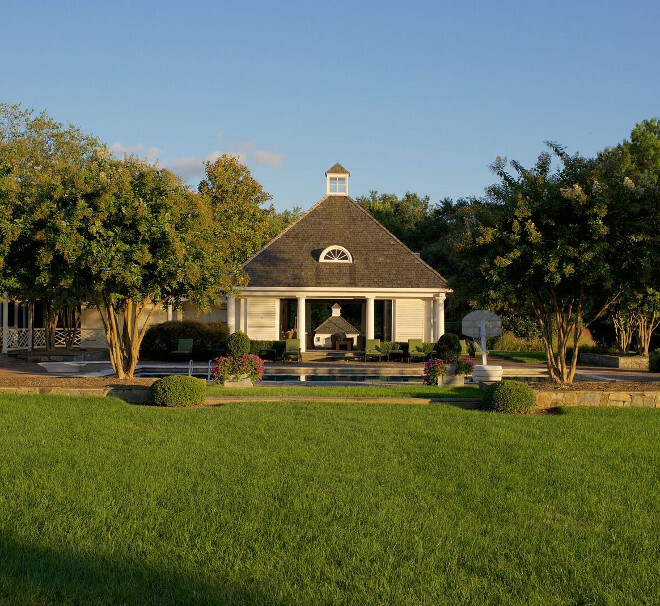 We have a pool house, guest house, two apartments, several garages and sheds, and a large barn. 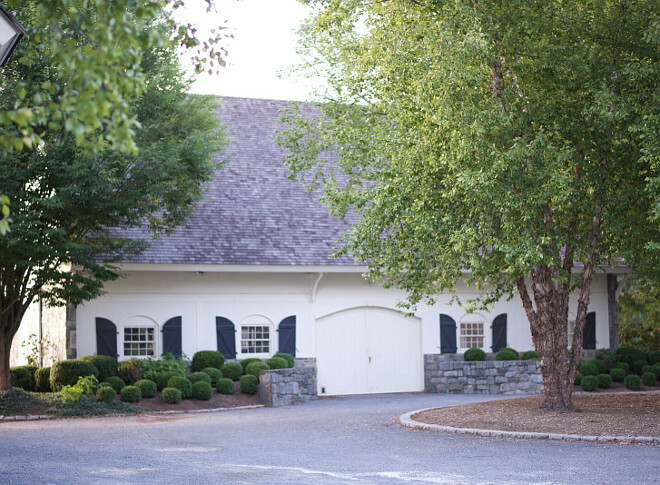 The prior owners kept horses on the property and the beautiful barn is a fully equipped stable. 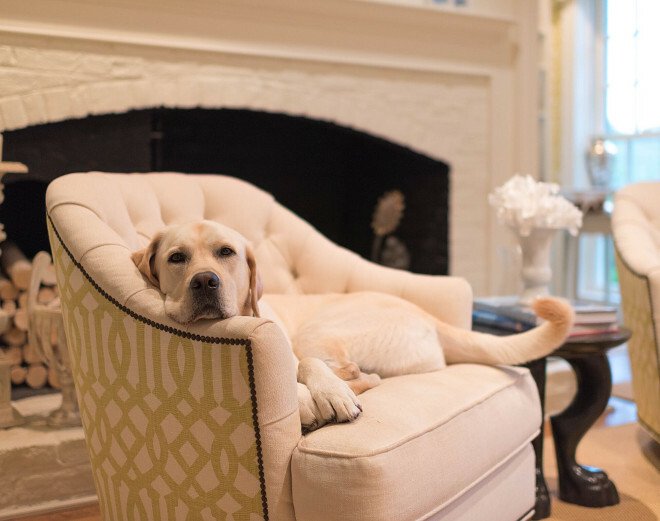 In designing and decorating our home, I wanted to have spaces that were elegant for guests, but at the same time practical for a busy household that includes 3 boys and 2 big dogs. After 10 years, I think that we accomplished our mission. 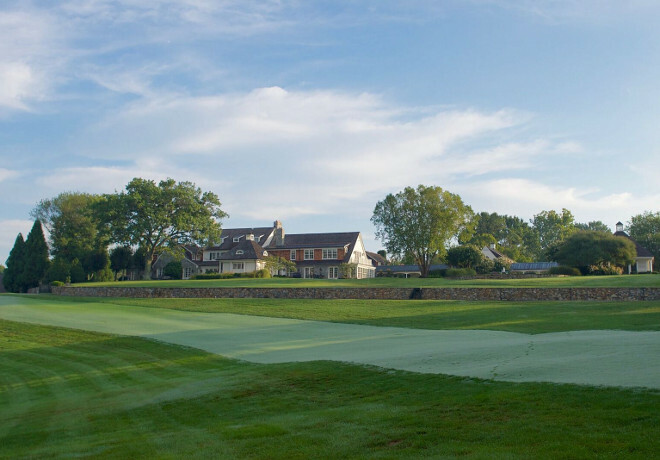 We entertain frequently and we use every inch of this house – and it’s held up quite well! 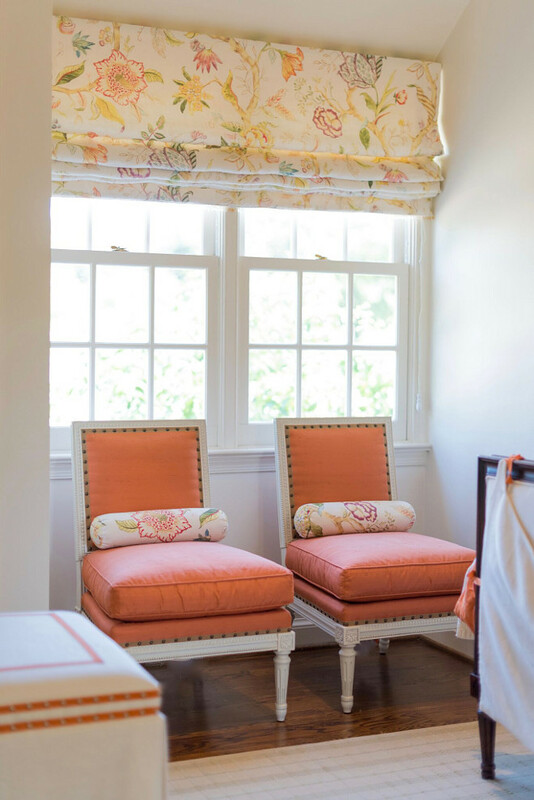 Slipcovers on some of the upholstered furniture definitely helps, as does hardwood flooring throughout the house with wool (naturally stain resistant!) area rugs. My design aesthetic is fairly traditional with a modern twist, and never stagnant. I’m always moving things around! I also appreciate the art of mixing high/low design. I love having art, antiques and furnishings with beautiful fabrics and finishes. And, I also love fun finds from Michaels and Target or a local flea market. Creating and designing homes for my family has been my love language for as long as I can remember and I can’t imagine that will ever change! 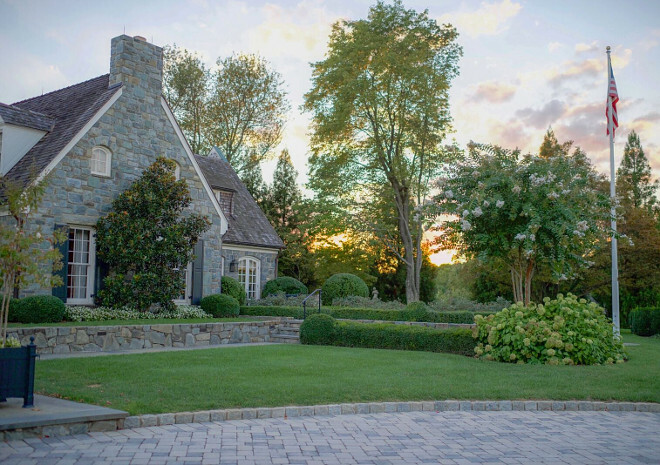 Missy’s home is truly breathtaking, from its manicured landscaping to its curated interiors. The exterior combines siding boards and stone. 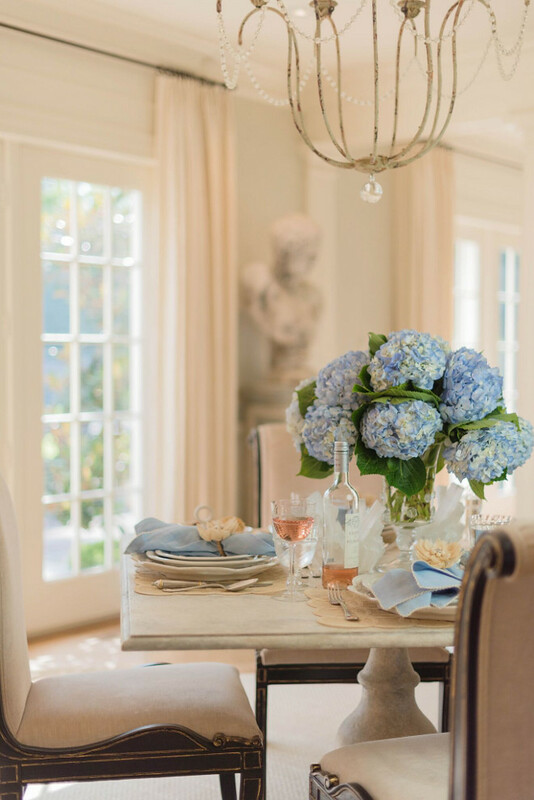 I love how elegant yet welcoming each and every room in this house feels. 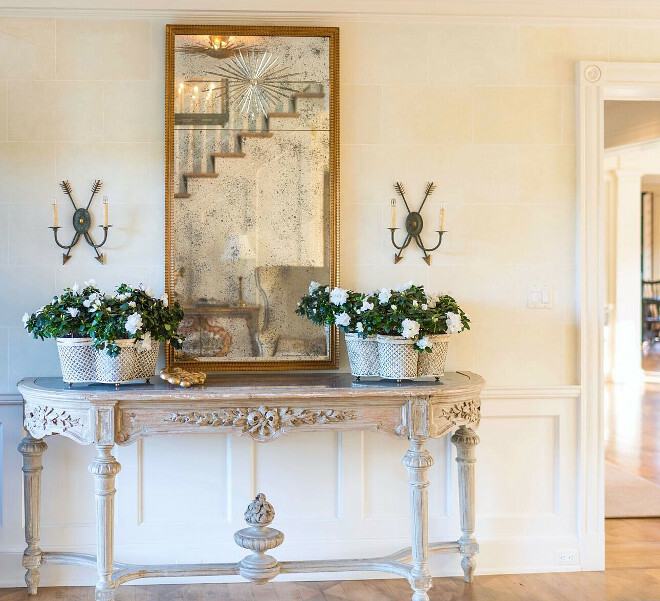 The sideboard is an antique, the planters are Niermann Weeks, mirror is John Rosselli, sconces from Tone on Tone, wainscot paint color is Benjamin Moore Ivory White 925, the floors and walls were painted by Billet Collins. 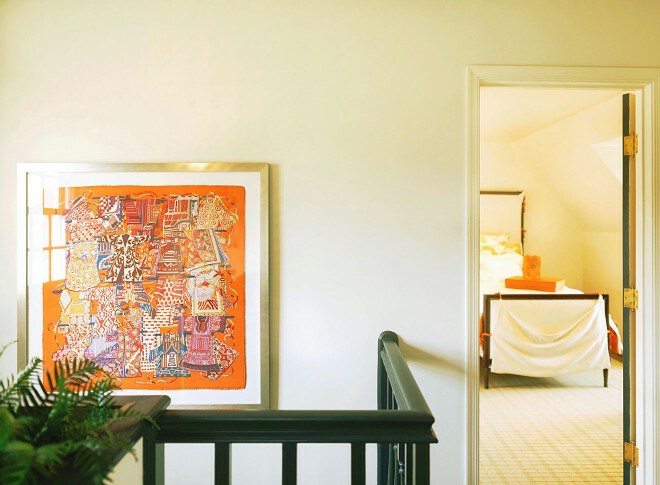 Paint color is Benjamin Moore Ivory White 925. Commode is an antique from New Orleans, lamp is from John Rosselli and the compote is from John Derian. Chair is from Dessin Fournir. The pillow is B.Viz. Chairs and coffee table are Dessin Fournir, fabric on chairs is Rogers & Goffigon, carpet is Stark. Porcelain flowers are by Vladimir Kanevsky on a table from Niermann Weeks. I would love to spend some time in this space. Isn’t it gorgeous? Dog sculpture, sconces and oil paintings are antiques. The wall finish is by Billet Collins. 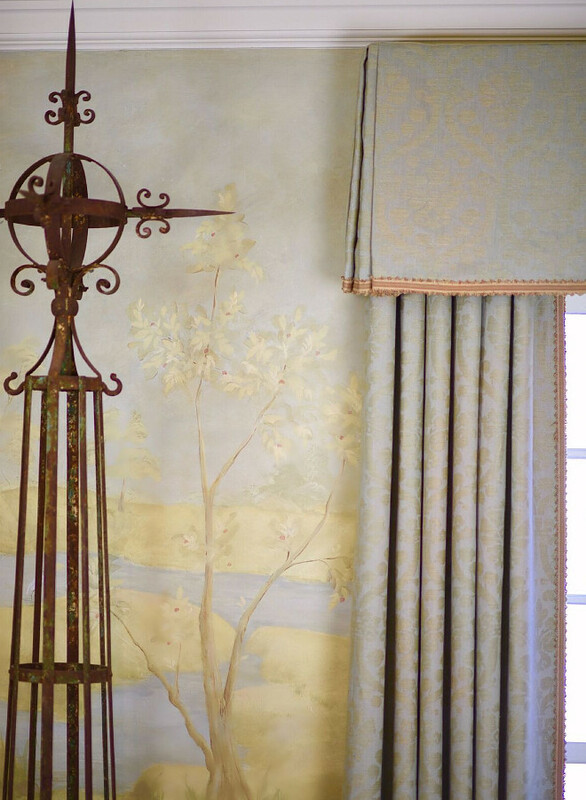 Drapery fabric is Fortuny and trim is Samuel & Sons, fabricated by Everett Design. Demilunes and urns are from Niermann Weeks. Lighting is Currey & Company Large Crystal Lights Chandelier. Table and chairs are from Niermann Weeks. 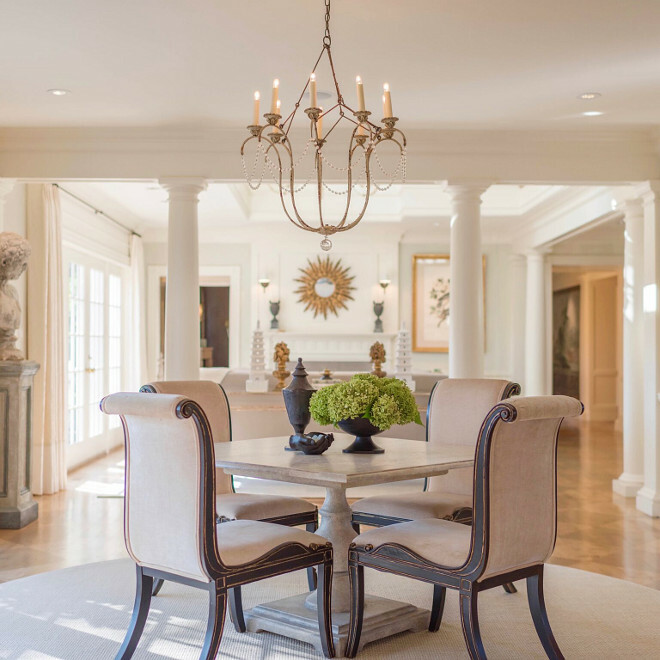 What a timeless dining room! Everything feels special in this space. Sconces are from John Rosselli, mirror, pagoda, chandelier and sideboard are from Niermann Weeks, chinoiserie box and plates are antiques. Carpet is Stark and the dining table is an antique. The chairs are from Hickory Chair. The drapery fabric is Rogers & Goffigon with trim from Samuel and Sons and the armillary is an antique from Gore Dean. 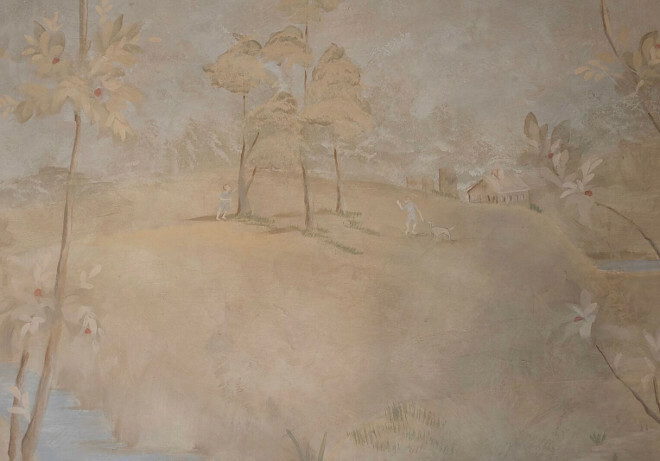 This breathtaking mural is by Billet Collins. Oil on wood panels are from Sotheby’s. Candlesticks from Aidan Gray and trim paint is Benjamin Moore OC-85 Mayonnaise. 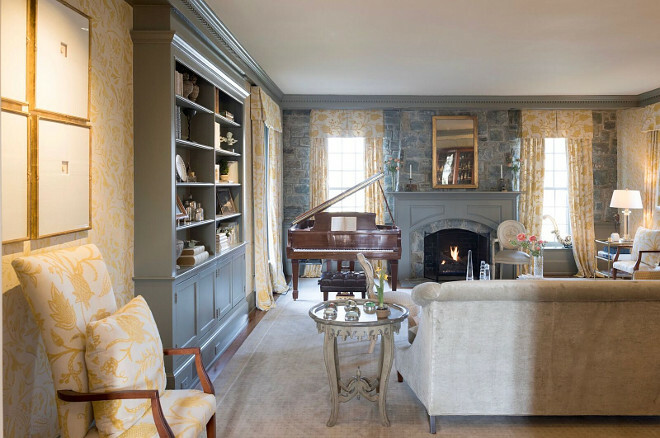 Chilly nights would feel extra cozy in this library. Piano is Steinway & Sons, the crystal lamp is from Visual Comfort, chairs are Barry Dixon and Neirmann Weeks, the intaglios are from Dessin Fournir and the carpet is Stark. Wall stencil is by Billet Collins. Couch is from Baker and side table is Amy Howard Collection. 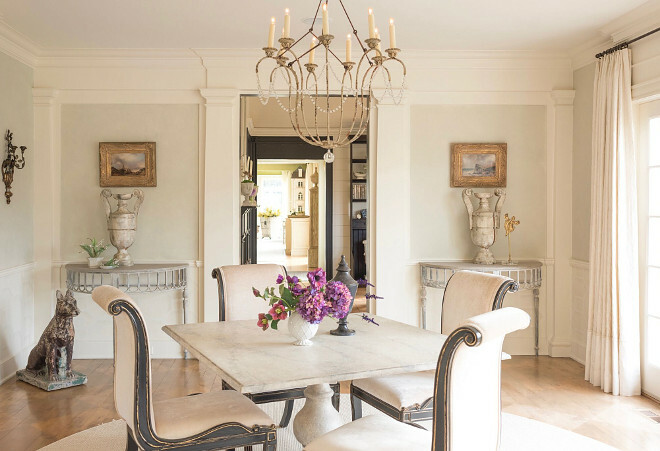 Chic and moody, this living room is perfect for entertaining. Club chairs are Barry Dixon for Tomlinson with fabric from Rogers & Goffigon and trim from Samuel and Sons. 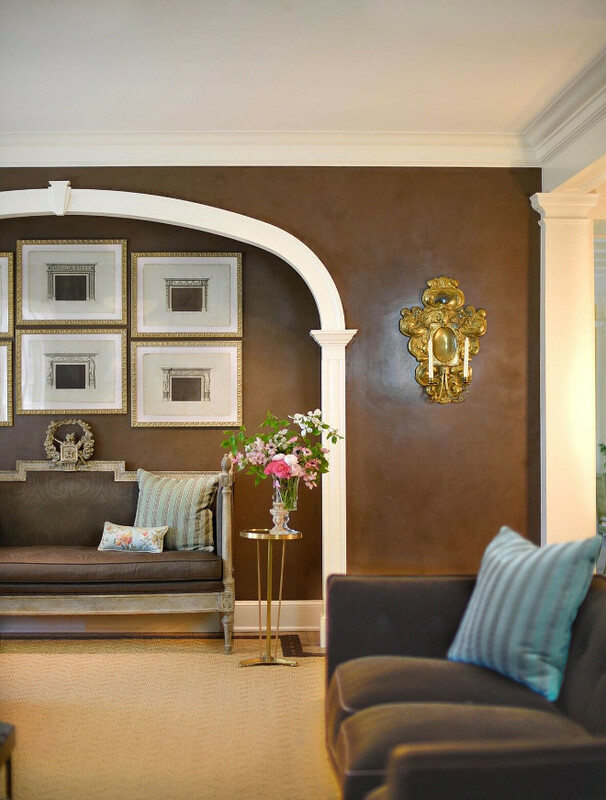 Coffee table is from Orly, sconces are Baker and Claude Lorrain prints are from Avery Fine Art. 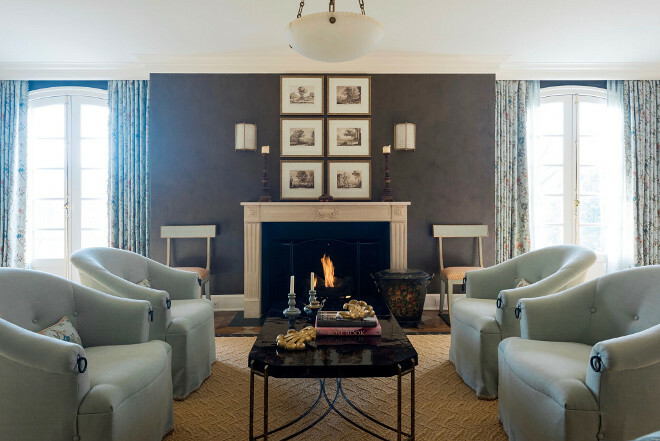 Chairs flanking the fireplace are from Neirmann Weeks with fabric from Scalamandre. 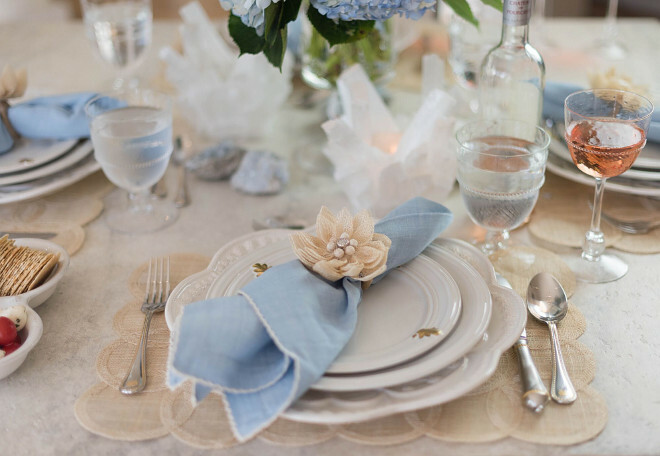 Drapery fabric is from Scalamandre with trim from Samuel and Sons and linen sheer fabric is Cowtan and Tout. Fabrication by Everett Designs. 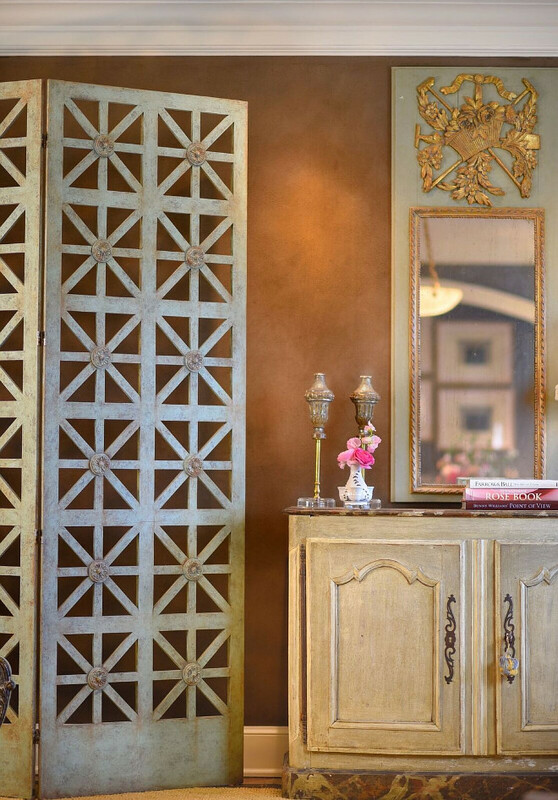 Walls are Venetian plaster by Lenore Winters and trim paint is Benjamin Moore OC-85 Mayonnaise. 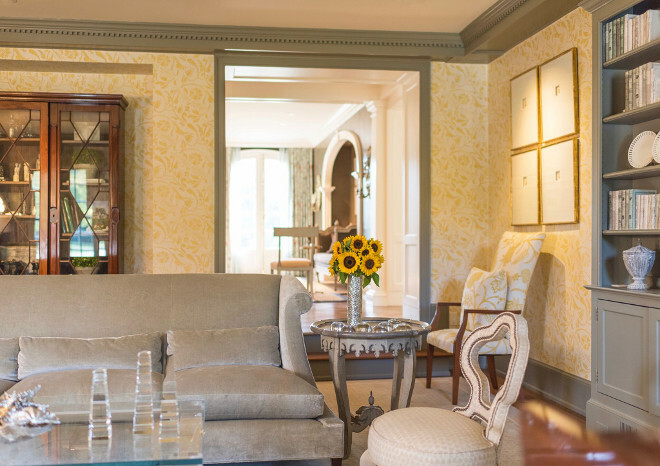 Settee is an antique from Tara Shaw covered in fabric from Rogers & Goffigon with pillow fabric from Cowtan and Tout and Scalamandre, fabrication from Everett Designs. 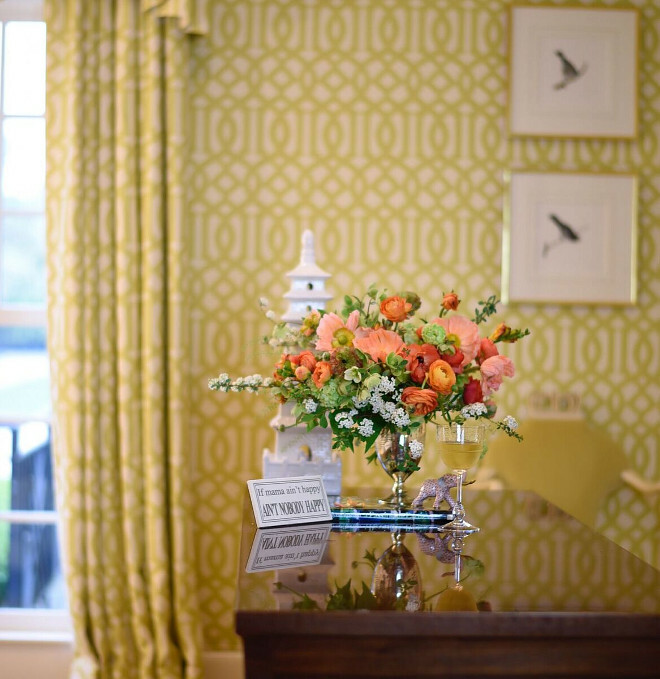 The mantle prints are antiques from the Nashville Antiques and Garden show. Carpet is from Stark. The sofa is from Baker Furniture with fabric from Rogers & Goffigon. 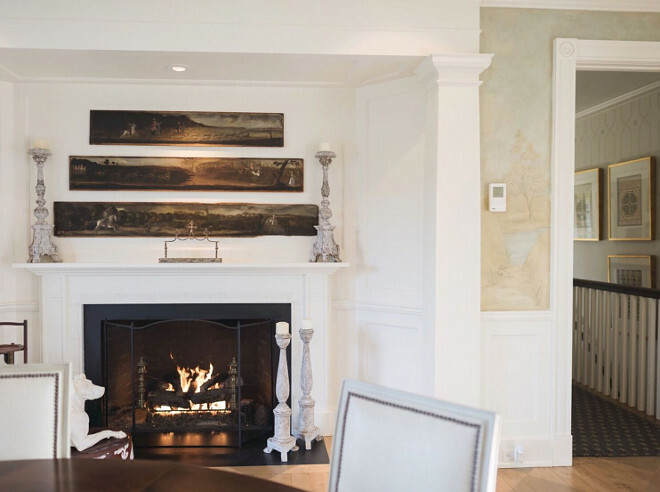 Zuber panels are from the Nashville Antiques and Garden Show, the Swedish clock is an antique from Tara Shaw in New Orleans. 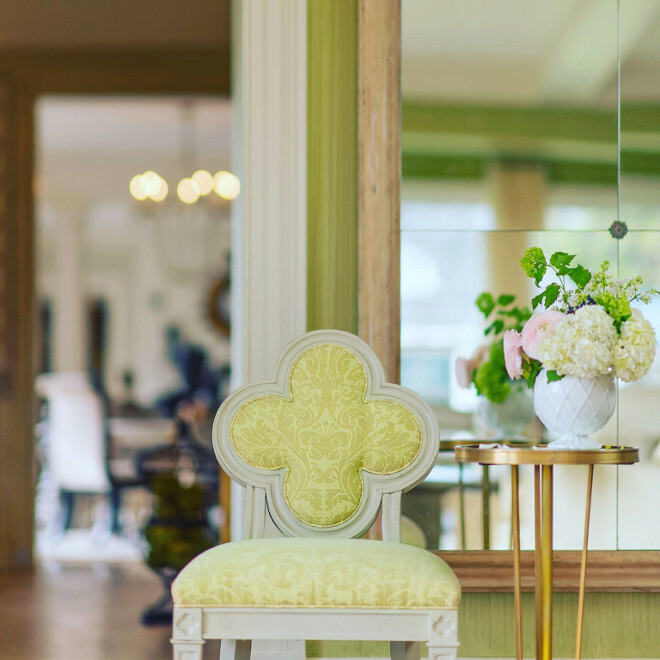 The screen and mirror are from Neirmann Weeks and the buffet is an antique. 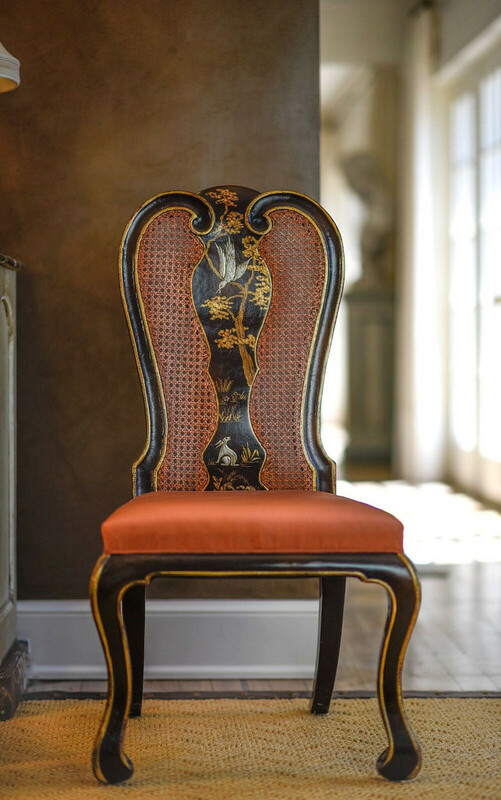 Side chair from Rose Tarlow with fabric from Rogers & Goffigon. 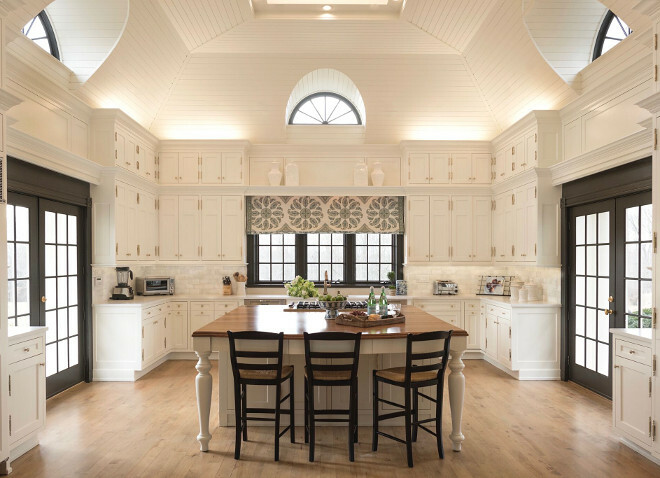 How amazing is this kitchen? It’s truly one-of-a-kind… unique, grand and inspiring! Appliances are Sub-Zero, Miele, Viking and Wolf. 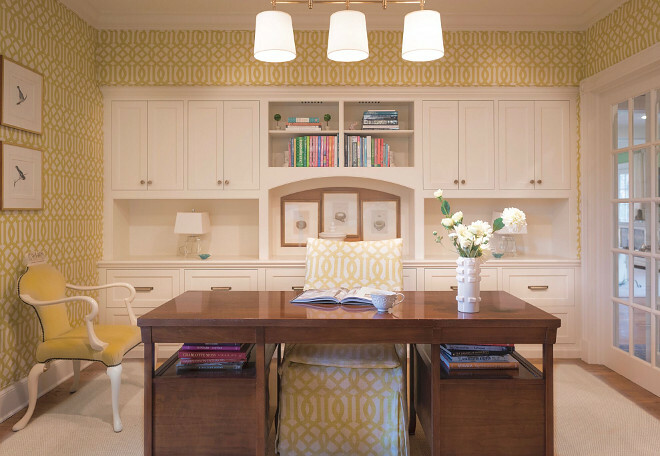 Cabinet paint color is Ivory White by Benjamin Moore. Bar stools are Pottery Barn. 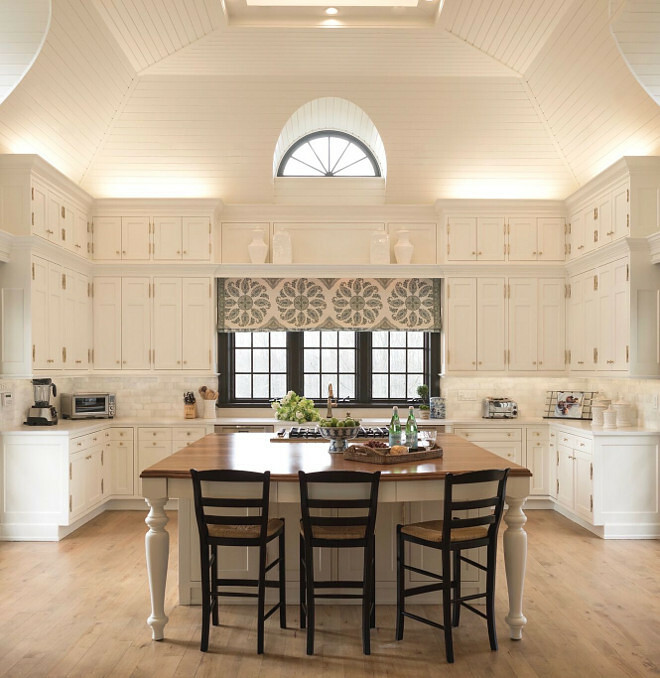 Isn’t it the most impressive kitchen ceiling you have ever seen? Wall paint color is Benjamin Moore Ivory White 925. Swedish sideboard is from Tone on Tone, table, chairs and hutch are custom and floor paint is by Billet Collins. Chandelier is Dennis & Leen. 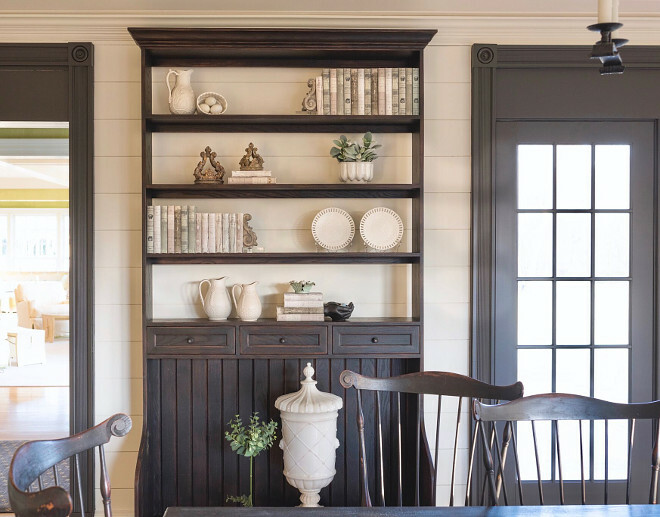 Open shelves allow the shiplap wall serve as back to this farmhouse-inspired hutch. 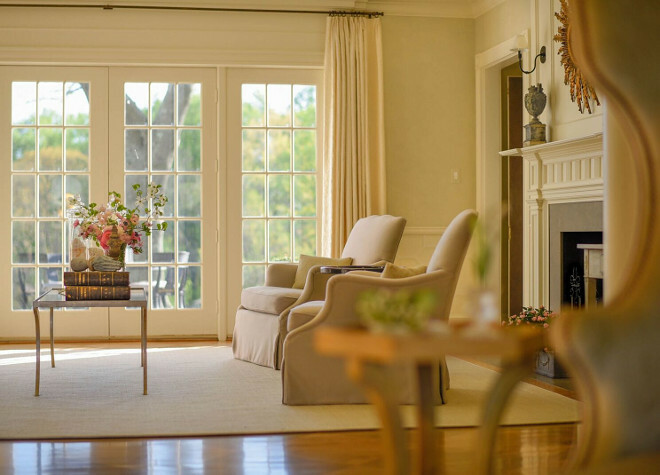 This spacious family room looks comfy and inviting. I love the color palette! Wall finish is from Billet Collins. Sectional is from Lee Industries, pillow fabric is Fortuny, coffee table is from Baker Furniture. 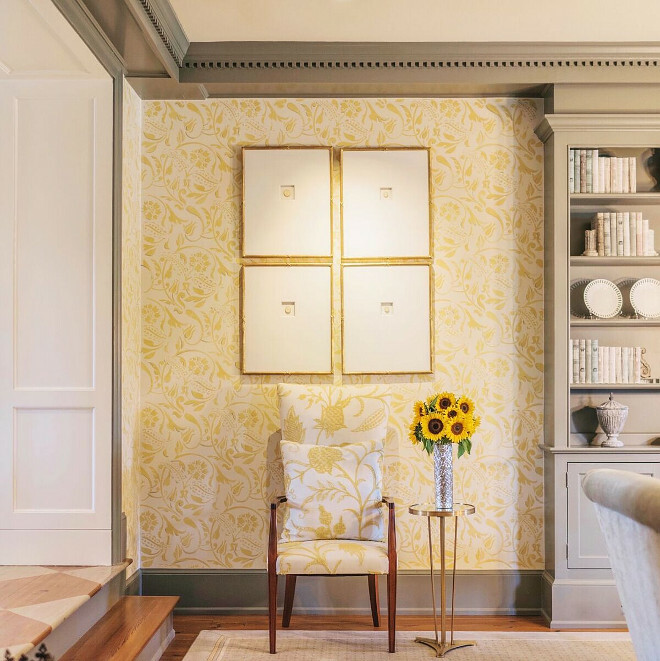 Fabric on built-ins is from Cowtan and Tout. Cabinet color is Benjamin Moore 925 Ivory White. Finial on column is from Aidan Gray. 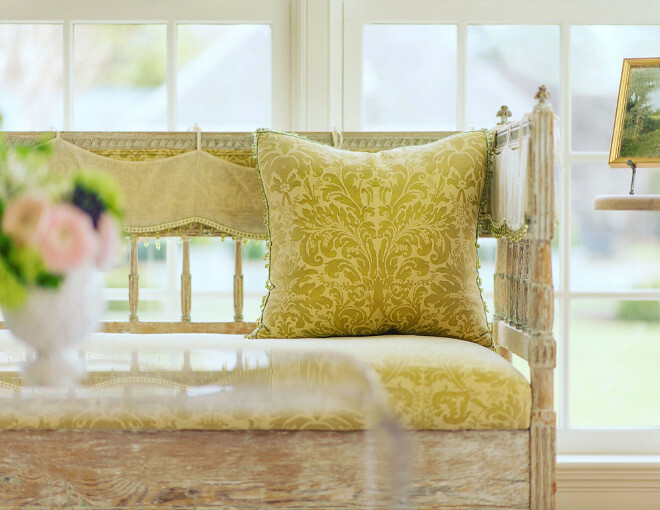 Antique bench is from Tara Shaw and fabric is from Fortuny. 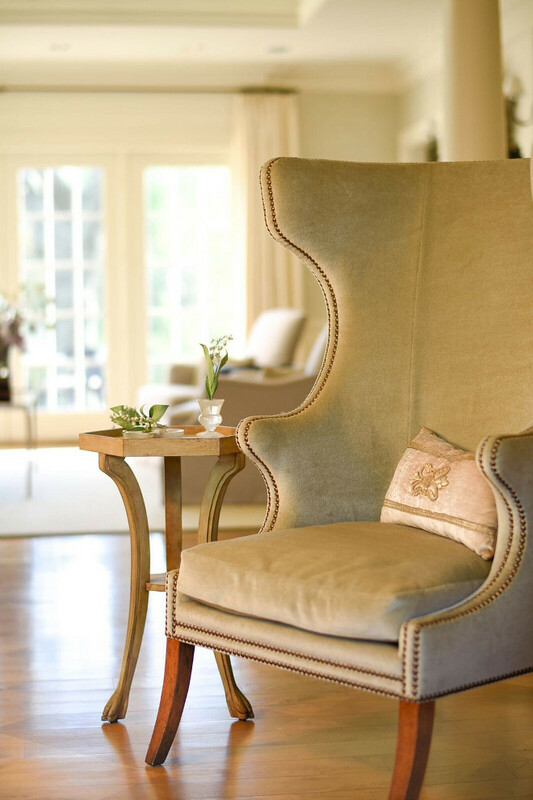 Quatrefoil chair is from Hickory Chair in fabric from Fortuny. Mirror is from Gore Dean. You simply cannot feel down in this space! How happy this is?! Wall finish by Billet Collins. 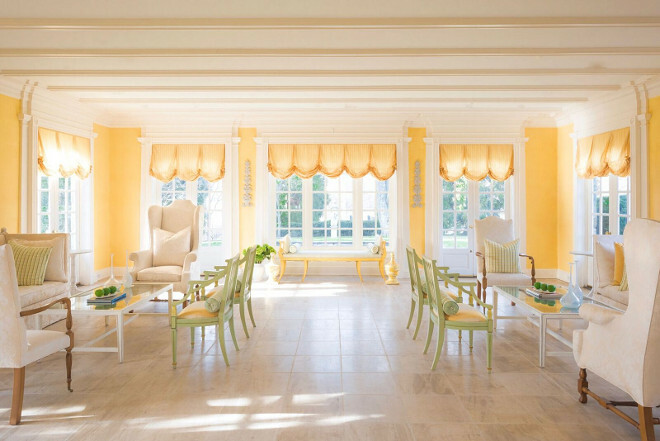 This sunny sunroom features a symmetrical furniture layout and a happy color palette. Love it! This space feels like summer all year around! Desk is from Baker Furniture. Trim and cabinet color is Benjamin Moore Ivory White 925. 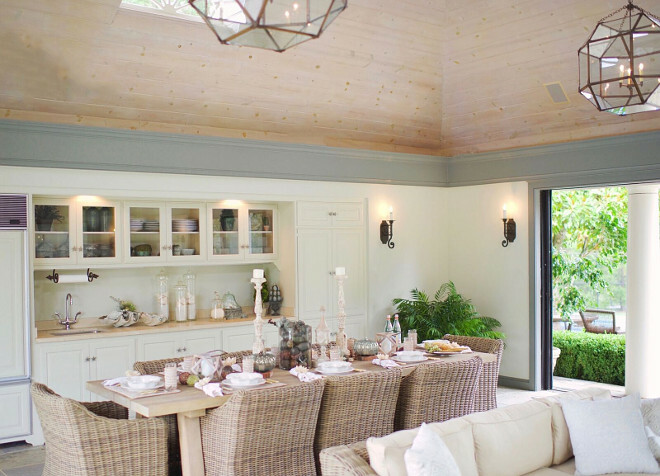 Light fixture is from Visual Comfort. 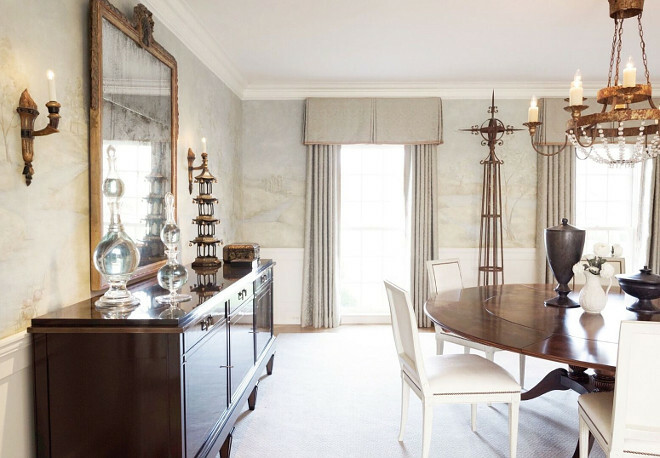 Wallpaper and drapery fabric is Kelly Wearstler for Schumacher. Club chair and table are from Baker Furniture. Baskets from the Container Store. Carpet from Stark. Paint is Benjamin Moore Ivory White 925, cabinet hardware is P.E. Guerin and bench is from Amy Howard Collection. 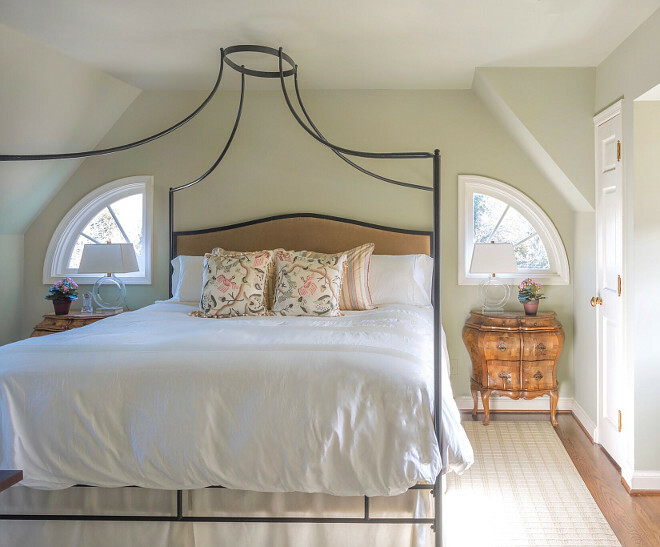 Missy’s bedroom is elegant yet very inviting. I love how serene this space feels. 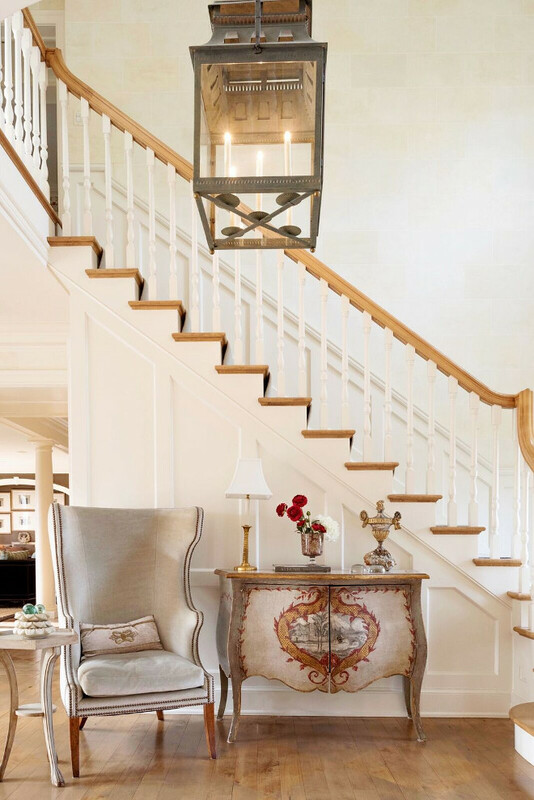 The bench is Niermann Weeks covered in Scalamandre, the side tables are Amy Howard Collection, the lantern is from John Rosselli and the drapery fabric is from Hinson and fabricated by Everett Designs. The secretary and chair are Hickory Chair. The carpet is from Stark Carpet. 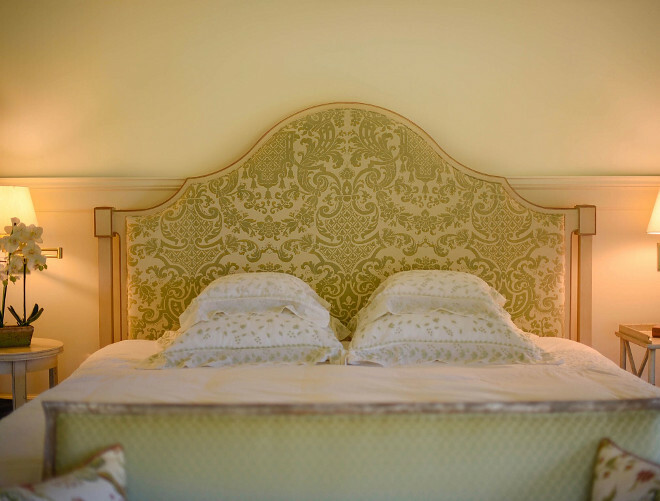 The bed is from Baker Furniture with upholstery fabric from Fortuny. The pyramid bookcase and the club chair are from Baker Furniture. Paint on walls and trim is Farrow & Ball New White No. 59. 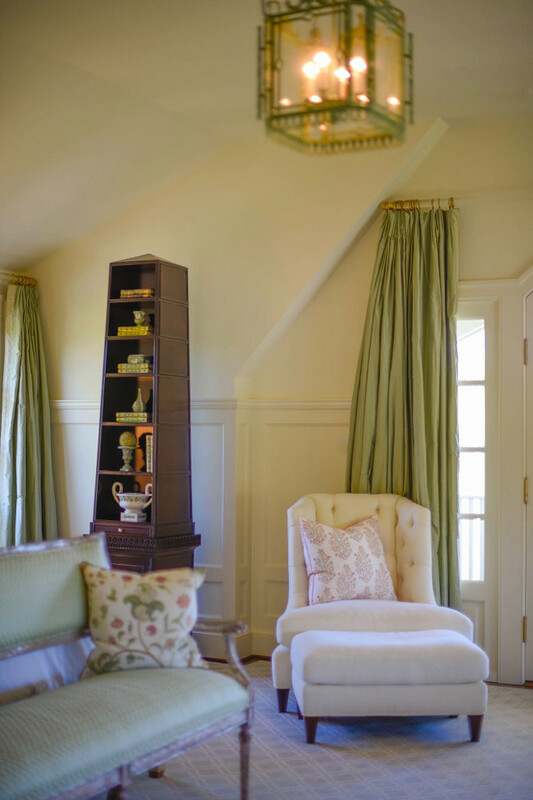 The dresser is Jacques Garcia for Baker Furniture, window seat fabric is Cowtan and Tout and drapery fabric is Fortuny. 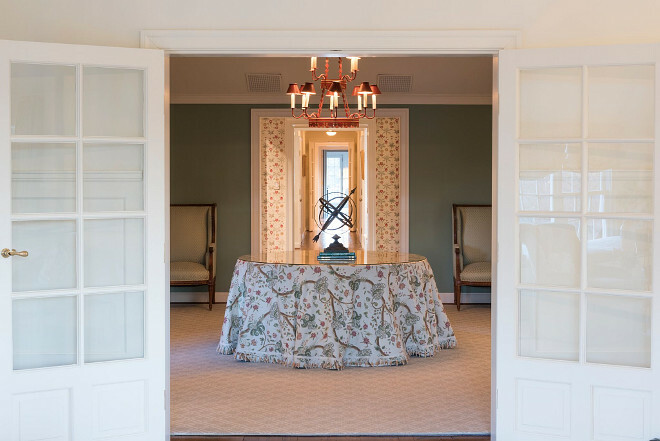 The table skirt is from Scalamandre with trim from Samuel & Sons, the chandelier is Niermann Weeks and carpet is Stark. Vanity is from Restoration Hardware. 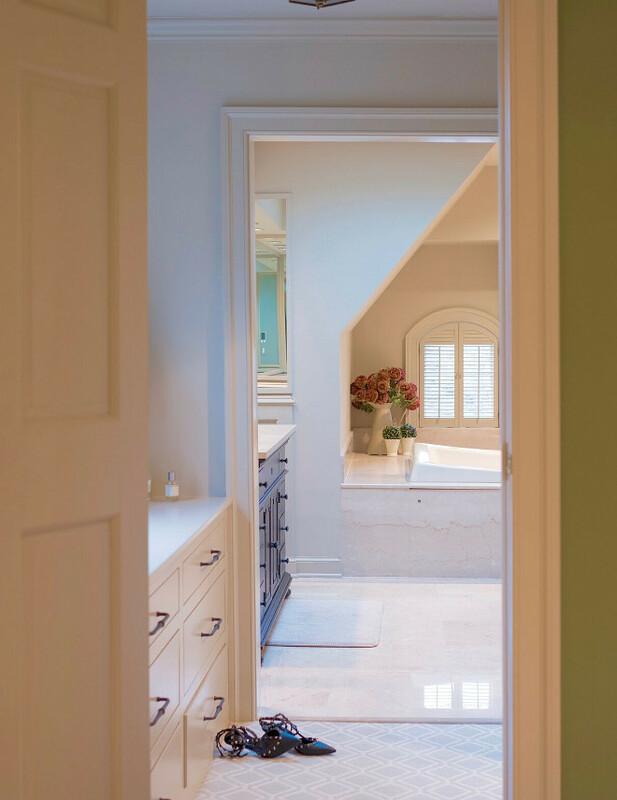 Paint is custom Farrow & Ball. 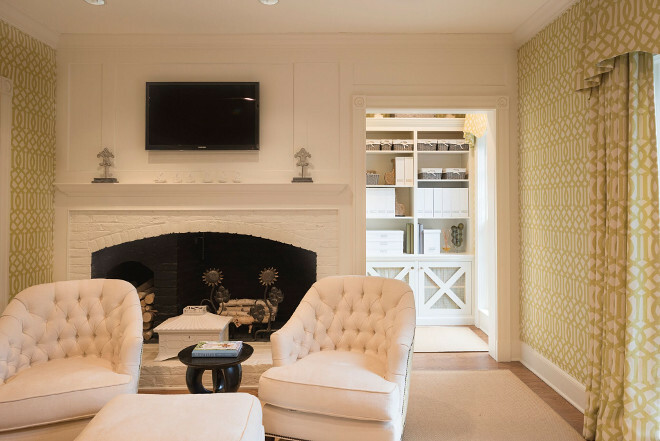 Walls are Benjamin Moore Ivory White 925. 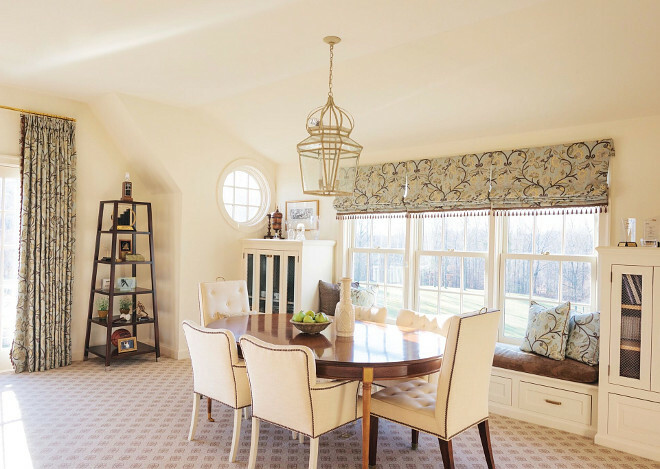 The table and chairs are from Hickory Chair, the carpet is from Stark Carpet, the etagere is from Baker Furniture and the valance fabric is from Cowtan and Tout with trim from Samuel and Sons. The framed scarf is Hermes. Isn’t it a brilliant idea?! 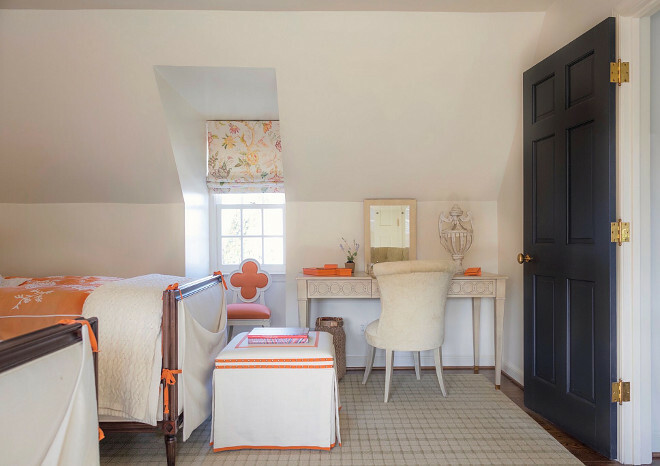 The paint color is Benjamin Moore Linen White. 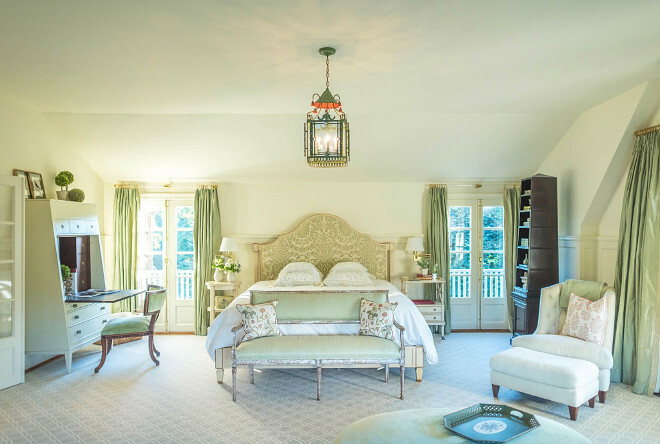 Chairs and twin beds are Suzanne Kasler for Hickory Chair, drapery fabric is Vervain with trim from Samuel and Sons. 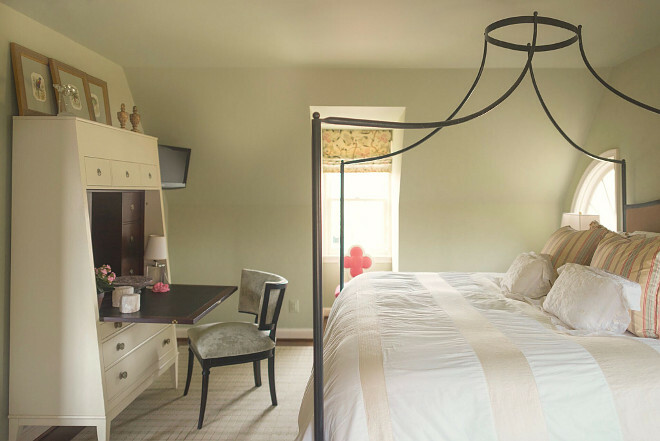 The secretary and both chairs are Hickory Chair, the drapery treatment is from Robert Kime and the walls are painted in Farrow & Ball French Gray. The bed is from Oly. 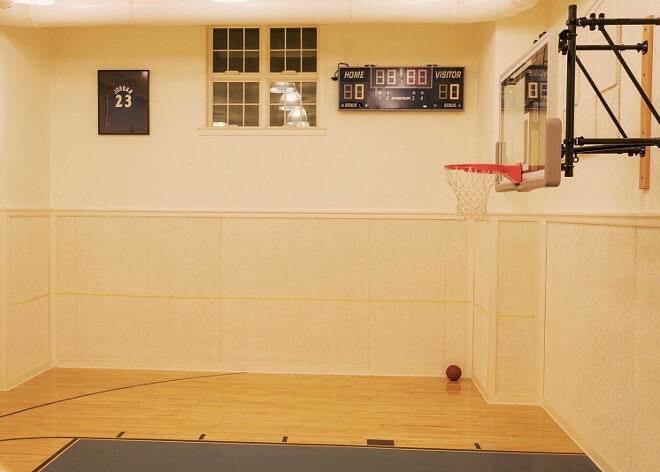 The basement features a large games room with wet bar, a threaten room and this fun basketball court. Paint in basketball court is Benjamin Moore OC-93 Sugar Cookie. 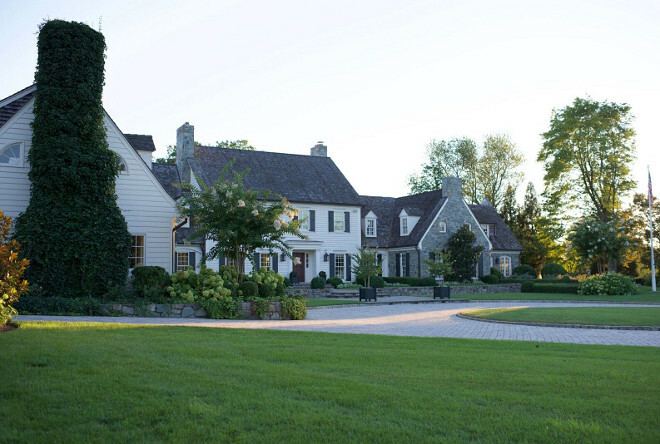 Exterior paint color is Benjamin Moore Linen White and Benjamin Moore Black Forest Green. 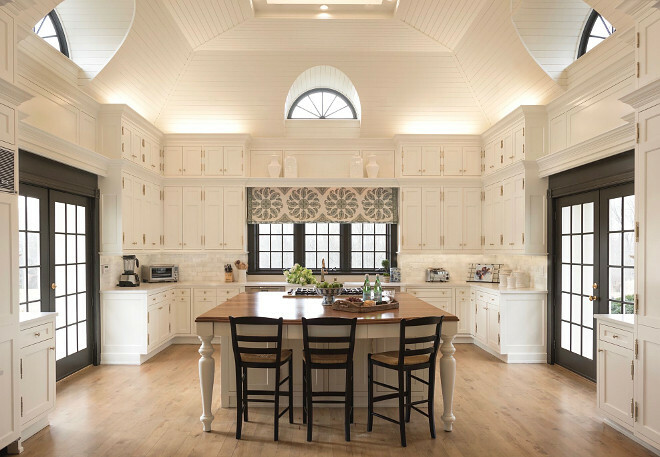 This home features stunning custom details. Notice the breezeway railing. 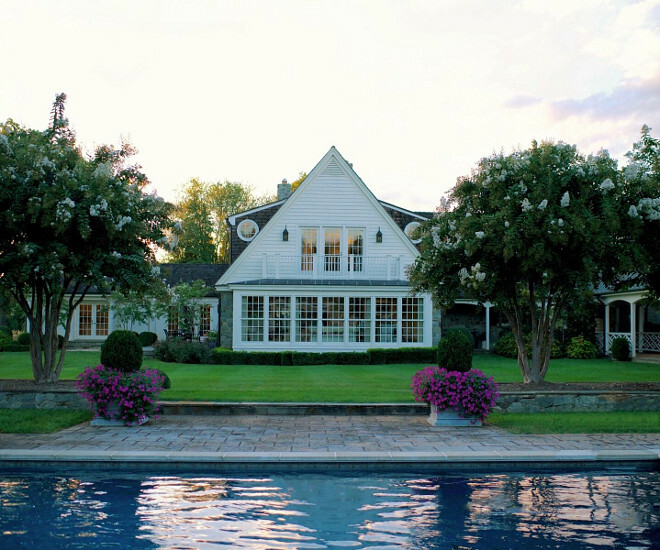 Gorgeous view of the pool and garden. Charming garden shed and fence. 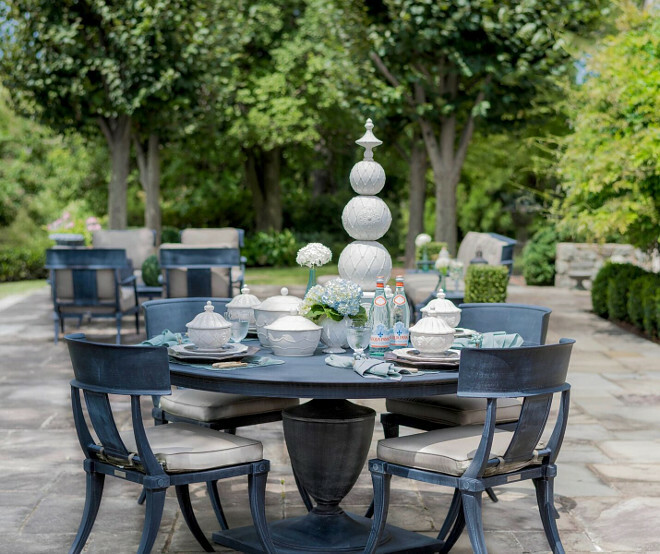 Outdoor furniture is from Restoration Hardware and table settings from Juliska. 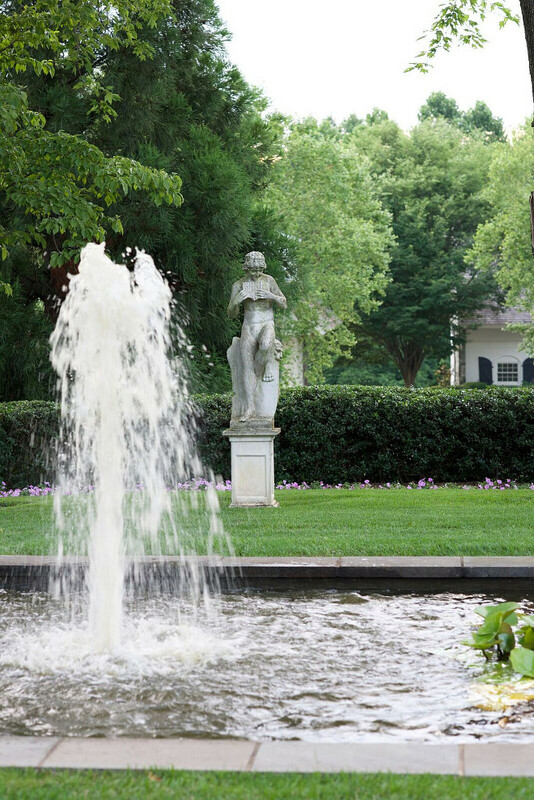 Wouldn’t you love to stay here for a while and hear the relaxing sound of this fountain? 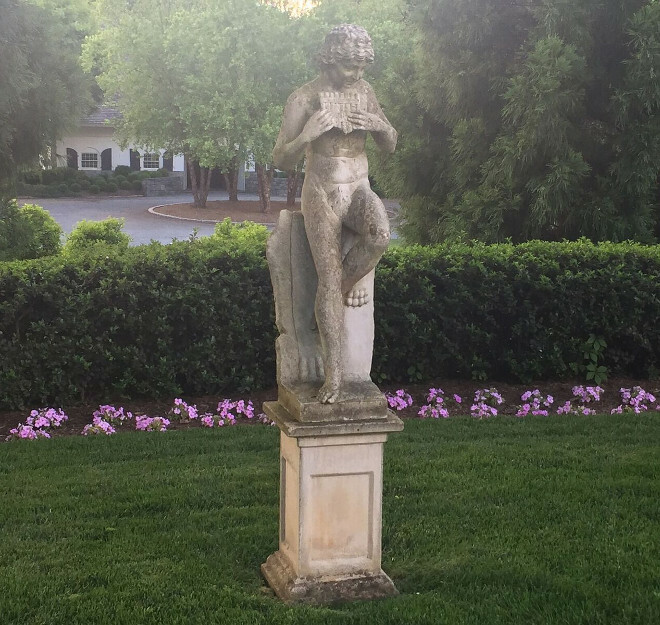 Marble statue of Daphnis from Treillage. 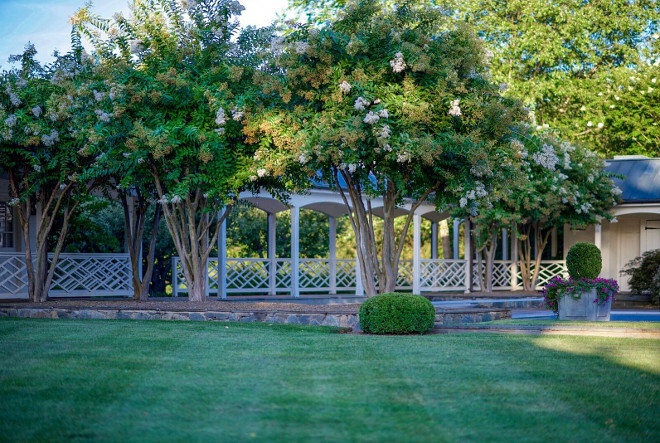 Outdoor paint is Benjamin Moore Linen White. Furnishings are from Restoration Hardware. 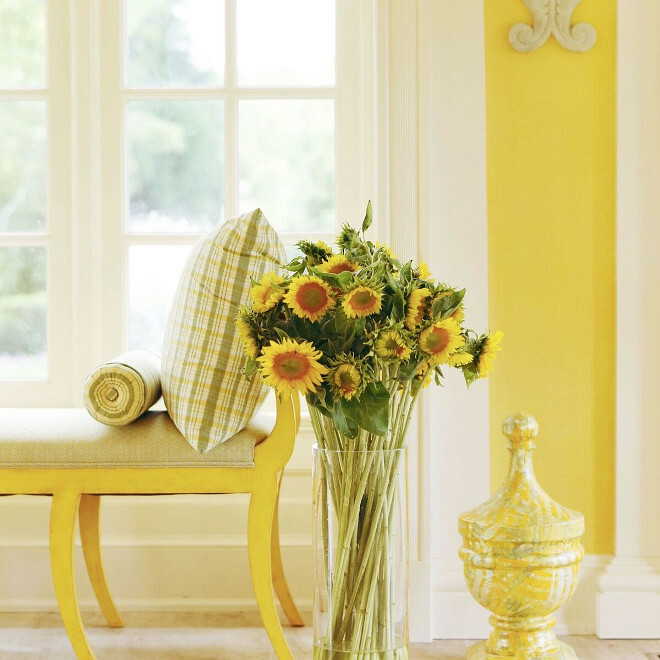 The indoor paint is Benjamin Moore, custom color. Can you imagine yourself going for a walk here? You could even have horses here. What a dream! 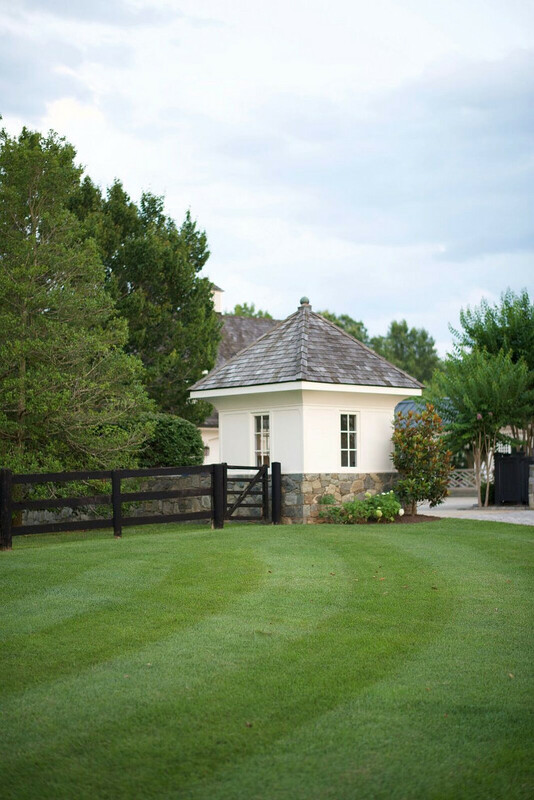 Exterior paint is Benjamin Moore Linen White and shutters are Benjamin Moore Dark Forest Green. 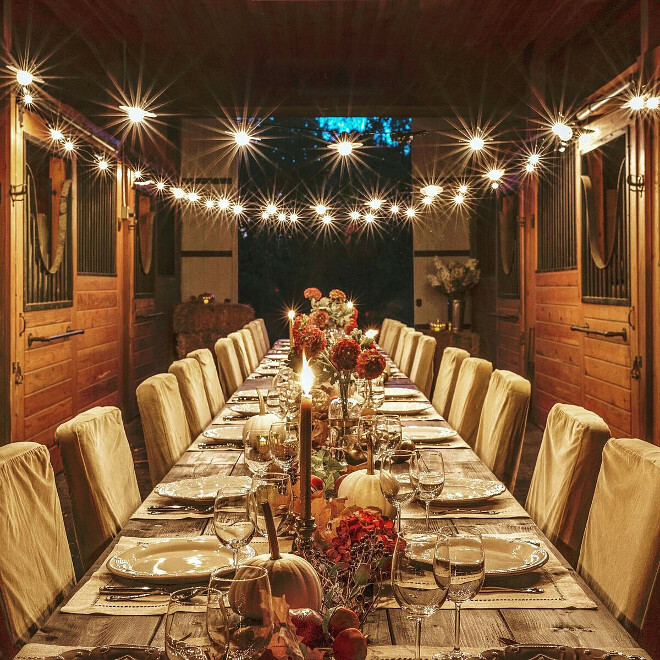 Farm tables are custom, chairs are from Pottery Barn, table setting from Juliska and string lights are from Target. 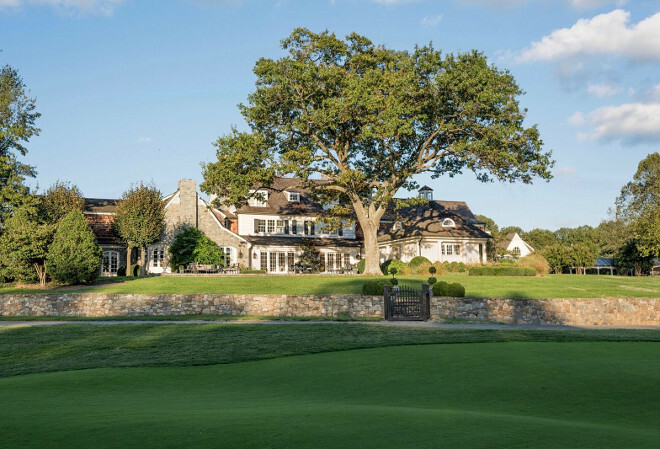 Truly a timeless property, designed with an impeccable taste. Make sure to follow Missy from @missyatperch on Instagram to see more photos of her beautiful home! Blog – Facebook – Twitter. 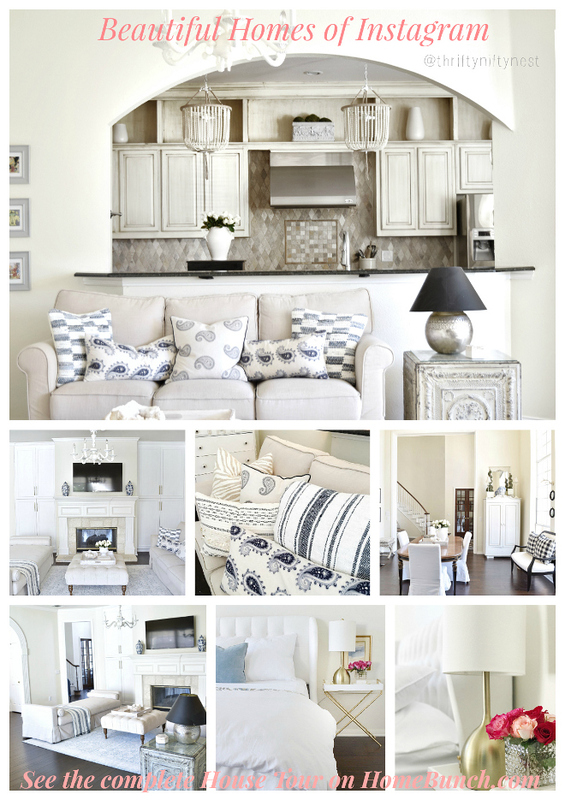 @JSHomeDesign: Beautiful Homes of Instagram. 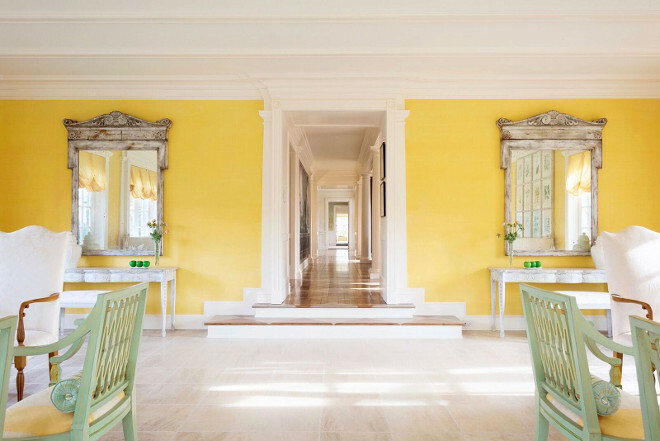 @Carolineondesign: Beautiful Homes of Instagram. 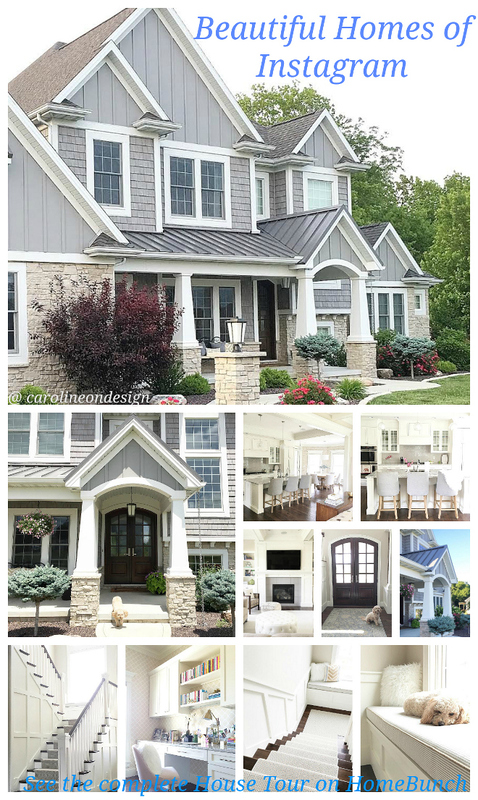 @Bluegraygal: Beautiful Homes of Instagram. @WowILoveThat: Beautiful Homes of Instagram. 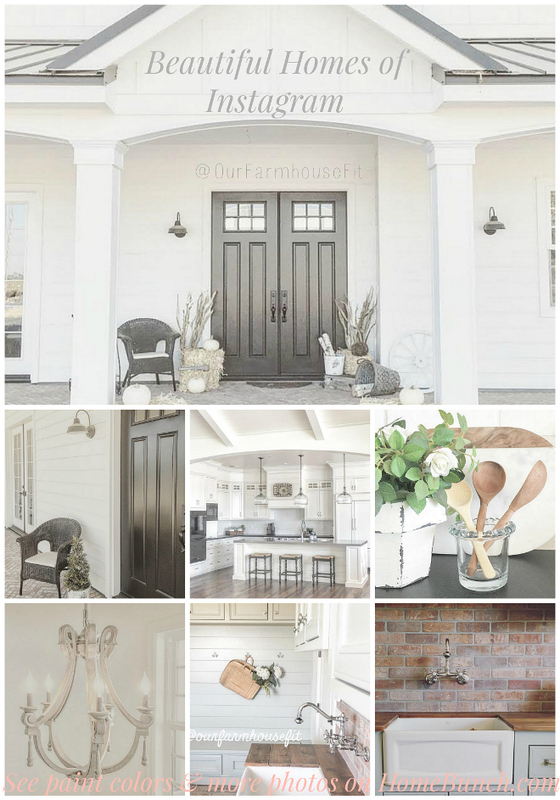 @OurFarmhouseFit: Beautiful Homes of Instagram. @JanScarpino: Beautiful Homes of Instagram. 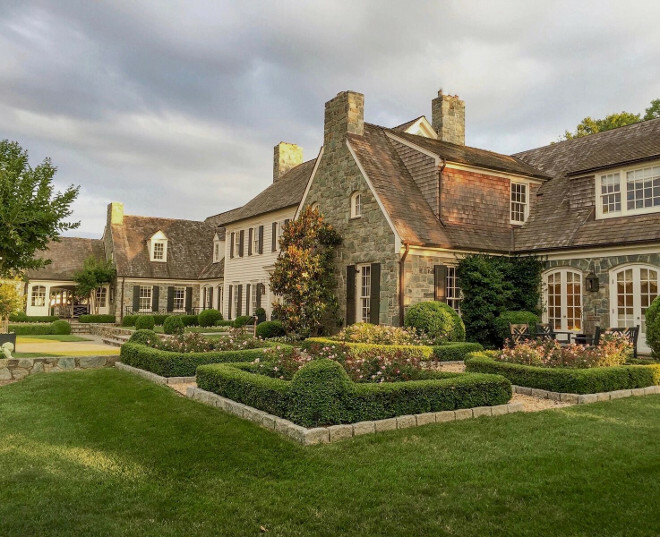 @realbryansharp: Beautiful Homes of Instagram. @artfulhomestead: Beautiful Homes of Instagram. 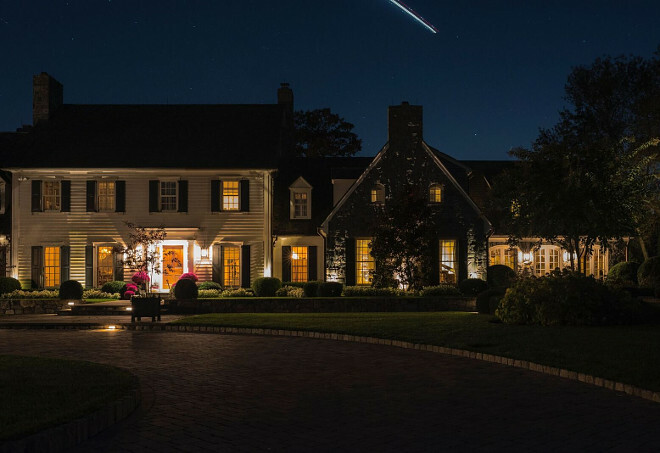 @BlountDesigns: Beautiful Homes of Instagram. 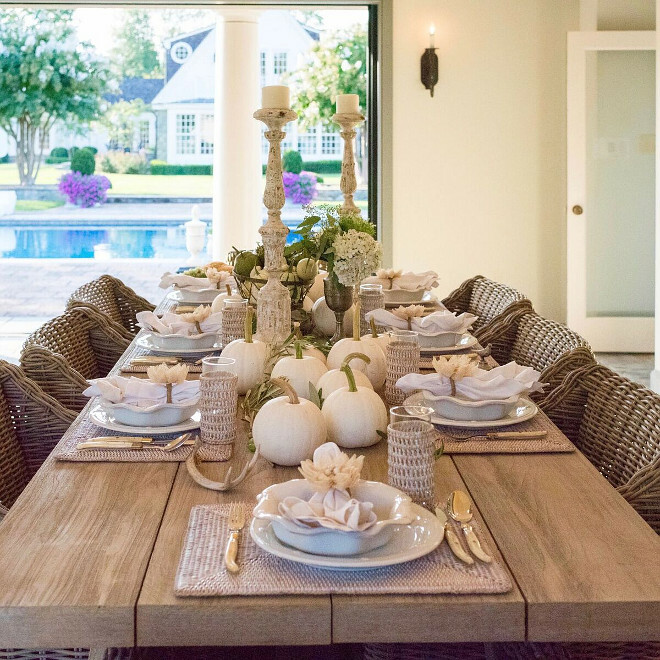 @PeonyPartyDesigns: Beautiful Homes of Instagram. @Birdie_Farm: Beautiful Homes of Instagram. @OrganizeCleanDecorate: Beautiful Homes of Instagram: Christmas Special. @PillowThought: Beautiful Homes of Instagram. @ClassicStyleHome: Beautiful Homes of Instagram. Get more “Interior Design Ideas” on Home Bunch. Hello, my wonderful friends! 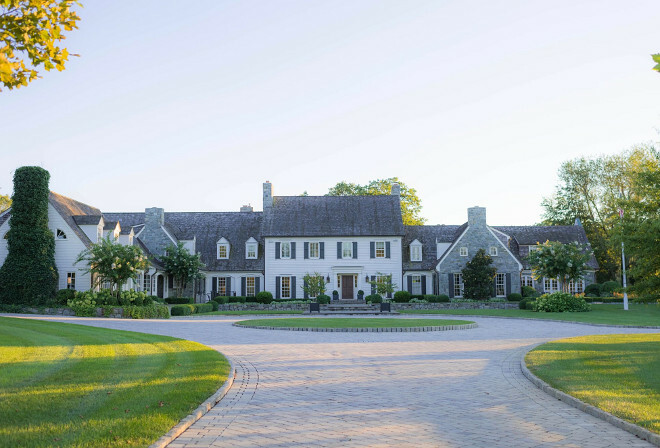 I hope you had a good time seeing this dream home and enjoyed knowing all the sources! May you all feel healthy and have a Blessed week. Remember to tell the people you love how much they matter to you! Just beautiful. A complete different world from the average person. Thanks for sharing Missy’s home….truly a dream.